Channel your inner Greek goddess with this 14 kt gold-plated brass bangle, handmade in New York by Emily Elizabeth. 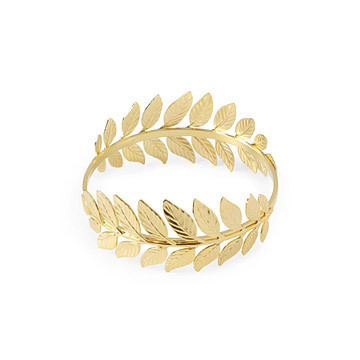 Featuring two large yet delicate fern leaves, this bracelet will add a romantic touch to any outfit. Wear it at wrist or push it further up for a more bohemian look. And for those with small wrists, be sure to check out the adjustable cuff version of this bracelet. Emily Elizabeth Kolins has always been drawn to artistic outlets of expression throughout her life, including jewelry making as a teenager. Upon graduating with a Bachelor of Arts in English with a minor in Art from Hunter College, she found herself working for a fine jewelry designer. It was here that Emily realized her love for the art of jewelry and began contemplating how she could turn her passion into a full-time career. She also recognized that many women--including herself--could not afford to spend $30,000 on a piece of fine jewelry. Encouraged by friends and family, Emily created a small collection of pieces in the fall of 2006 and Emily Elizabeth Jewelry was officially launched. Primarily working with goldplated brass charms, chains and wire, Emily aims to create pieces that are feminine and classic, while still modern and whimsical. Additionally, Emily purposefully designs and prices her jewelry so that women can afford to wear something special and feel beautiful everyday. The company is based in New York where Emily works and resides.